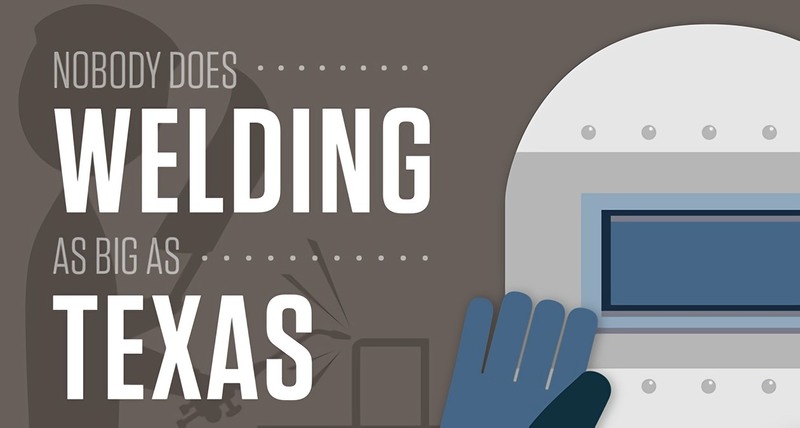 With more welding jobs in Texas than anywhere else in the country, the Lone Star State is one of the best places in the world to find a welding job. The petroleum industry has created numerous pipe welding jobs in Texas, and well-trained pipe welders have plenty of thriving industries to choose from to start their careers. In fact, skilled welders are in such short supply in the state that one employer even had to post armed guards at his job sites to prevent corporate poachers from stealing his talent. Wages for men and women in skilled trades like welding have increased more than 40 percent over the last five years in Texas. These professionals now earn 8 percent more than their counterparts across the country. Nationwide, the Bureau of Labor Statistics 1 reports that the median annual salary for welders is $37,420; however, in Texas it’s more than $40,000 a year. While welding career opportunities abound across the state, they are especially plentiful in three metropolitan areas: Ft. Worth/Arlington with 3,700 jobs, Dallas with 5,500 jobs, and Houston with nearly 18,000 jobs—more than in Pennsylvania, which is the third highest state in the nation with 17,000 jobs. Individuals can complete welding school in Houston, Texas, in as little as 7 months, after which they’ll have the advantage of entering the industry with welding specialist training. Advanced welding certifications can lead to higher salaries. Those with welding inspector training or expertise in underwater welding, welding engineering, or robotic welding can bring in anywhere from $41,000 to more than $100,000 annually. Texas and oil have always been somewhat synonymous—at least since the discovery of Spindletop at the turn of the 19th century. Often compared to California’s Gold Rush, the oil boom that followed the well’s discovery propelled Texas into the position of a major petroleum producer and industrial power, notes the Texas State Historical Association. In 1902 alone, the well produced more than 17 million barrels, glutting the market to the point that a cup of water in some boomtowns was pricier than a barrel of oil. Companies established along the Gulf Coast at the time include industry giants like Exxon. Texas continues to lead the nation in oil production. Welders and pipefitters are needed to help construct and repair much of the infrastructure that supports this industry. Several career paths are available to welders in Texas. A qualified welder should have no problem aligning his or her interests to one of the many flourishing industries. Architectural welders can be proud of contributing to the construction of everything from skyscrapers to sculptures. The Disney Concert Hall and the Bay Bridge in California are two impressive products of architectural welding. Automotive welders help manufacture and repair the cars that Americans rely on to travel to work and the trucks necessary for transporting goods throughout the country. Welders in this industry could also find themselves working with pit crews for NASCAR events at the Texas Motor Speedway. Railroad welders maintain railcars and railroad tracks. Demand in this field is expected to rise following recent changes to safety rules for the oil tank cars—often referred to as rolling pipelines—that support the petroleum industry. These are just a few of the industries where welders can find steady, well-paying work. Opportunities are also available in agricultural welding and manufacturing; industrial manufacturing; boiler, tank, and container manufacturing; electric power generation, transmission, and distribution; and shipbuilding. The American Welding Society predicts that more than 216,000 newly trained professionals will be needed to fill welding positions throughout the nation before 2020, many of which will be in Texas. Unfortunately, employers in the state are already struggling to find men and women with adequate welding skills: as many as 40 percent of applicants for welding jobs fail their employment examinations. A Texas welding program can provide the hands-on training necessary to prepare welders for work in the field. This may be one reason employers prefer to hire welders 2 who have completed training programs. Tulsa Welding School (TWS), has been preparing students for successful welding careers for over 60 years. Individuals can complete welding training at the TWS Houston, Texas campus in as little as 7 months, so that graduates can quickly seize one of the state’s many welding opportunities.